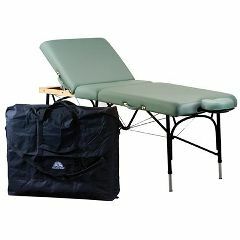 The Alliance Aluminum portable massage table is your best choice for a professional table that provides portability and a back rest top. This aluminum table is lightweight and offers exceptional strength, unbeatable client access, and positioning accuracy. Easy adjustments that allow six positions and up to 60Â° of tilt permit a greater number of modalities such as waxing, facials, pregnancy massage, reflexology, acupuncture, etc. *Call for Ultra Touch pricing. Weight: 30 - 36 lbs.